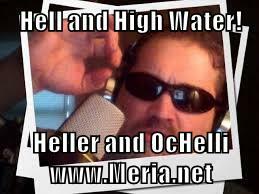 1/8/19 Hell & High Water, with Meria and Chuck Ochelli. Fresh blood in the house; trumps Reichstag fire? Distraction-the wall; “national emergency”? Martial law; Nancy Pelosi; the Fairness Doctrine; Media caves in to trump -why? Chris Cuomo; trumps ego; Sarah the liar; Pence the liar; DHS; TSA agents – gas money? tv is mind control, thus called programs; Protests in Belgrade & Paris-where’s the media? trump walk backs; the boycott Israel bill; Christian Bale on Cheney; Stephen Miller; Roger Stone; planned chaos; Alexandria Ocasio-Cortez; the economy pre-Reagan; trump fans; losing benefits; Ben Carson at HUD and much more. One Response to "Hell & High Water, with Meria and Chuck Ochelli"
Hell and High Water, Meria and Chuck…the Dynamic Duo, fabulous, as usual!